The interim budget documents also show that the Modi government spent Rs 9,949.04 crore from the Rs 10,500 crore earmarked for the scheme last year. 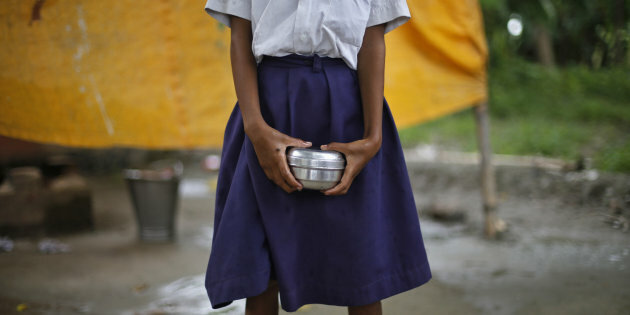 New Delhi: The interim budget for 2019-20 has allocated Rs 11,000 crore for the national programme of mid-day meals in schools – Rs 500 crore more than the funds earmarked in the February 2018 Union budget by finance minister Arun Jaitley. However, the interim budget documents also show that the government spent only Rs 9,949.04 crore from the amount earmarked for the scheme last year. Though at Rs 11,000 crore, it is the highest amount allocated by the Narendra Modi government to the scheme, covered by the National Food Security Act, 2013, it still is a lot less than the budgetary allocations made during the financial year 2013-14, which was Rs 13,215 crore. When the Modi government slashed the annual budget from Rs 13,215 crore in FY 2013-14 to Rs 9,236 crore in the FY 2014-15, several social scientists and activists raised a hue and cry as the programme, that covers about 11 crore children across the country, has been successful in lowering the school dropout percentage considerably. It has also rejuvenated enrolment in government-run schools as it helps provide nutritional benefits to underprivileged children. In the 2016-17 budget, the allocation was raised to Rs 9,700 crore. However, in the 2017-18 budget, the government cut the allocation for the programme and kept aside only Rs 9,092.23 crore, less than even the 2015 share. “What has been the Centre’s defence for cutting the annual budgetary allocation to the scheme is the resetting of the fund sharing ratio between the Centre and the states from the existing 75:25 ratio to 60:40 ratio in 2016. It was done as per the NITI Aayog’s report on rationalising all the central welfare schemes. However, the allocation for the mid-day meal scheme was anyway low. Within that money, it was very difficult to provide a better nutritional meal to a child. They were mainly providing just khichri. This change in the fund sharing ratio further affected the programme,” said Right to Food campaigner Dipa Sinha. The Centre’s decision to seek Aadhaar cards to supply mid-day meal to children is also said to have further affected the scheme.